Electricity has been known of for a long, long time. The Greek, Thales of Miletus, mathematician, physician and astronomer who lived 600 years before Christ, already knew the ability of amber to attract light materials. It is from the Greek name of yellow amber (elektron) that the word Electricity was created. Yellow amber, the fossilised sap of coniferous trees, has been used since Antiquity as a semi-precious material in jewellery manufacture. William Gilbert (1544-1603) Royal physician to Queen Elizabeth I of England, used the term vis electrica, to describe electrical phenomena. At the time, it was already known that certain fish possessed to ability to inflict electric shocks. The Marbled Electric Ray (Torpedo Marmorata) is one such example. The electric organs of this animal, or plates, are found behind the eyes, current passes vertically through the body. Certain species of Ray, such as the Electric Ray (Torpedo Nobiliana) are capable of producing a power discharge equivalent to 200 volts at an intensity of 8 amperes. The magnetic properties of lodestone (found in Aydin in Turkey) or magnesium (from Bolos in Greece) have also been known since Antiquity. Magnetite (Iron Oxide, Fe3O4) can be found in its natural state throughout the world. This black coloured mineral possesses exceptional magnetic properties and is found in particular abundance near to the North Pole. It is a very rich source of iron ore. Despite the early awareness of electricity, it took until the end of the 17th century before physicists started to scientifically explore the new area of physics that we now call electrostatics. In 1730, Charles François de Cisternay Du Fay (1698-1739) had already described the production of positive and negative electricities generated by rubbing a glass rod or resin (vitreous electricity and resinous electricity) and carried out several experiments on the conductivity of flames and materials. At the same time the British physicist Stephen GRAY (1670-1736) discovered that objects could be 'remotely' electrified and developed the ideas of conductor and insulator. The savants of the time were still eager to explain the electric phenomena that had the most spectacular influence on man and beast (lightning, storms, ....). In 1750, Andreas Cunaeus, a student of Petrus VAN MusSchenbroeck (1692-1761) tried to electrify water contained in a flask, by subjecting it to charges generated by an electrical machine. This primitive machine comprised of a ball of sulphur, turned by hand, had been invented in 1670 by Otto von GERICKE (1602-1686), a German physicist and burgermeister of Magdeburg, his place of birth. Von GERICKE also carried out his hemisphere experiment there, hence the name Magdeburg Hemispheres. Cunaeus didn't observe anything special and stopped his experiment. When taking the flask in his hand, he received a violent electric shock. Van Musschenbroeck repeated the experiment and received the same shock as his student, leading him, in writing to Reaumur at the Paris Academy of Sciences, to state that he would not repeat the experiment, even for the kingdom of France. He had just made a major discovery, the capacitor which would become known as the Leyden Jar after the name of the town where the experiment took place. Ewald Georg von KLEIST (1700-1748), dean of Camin cathedral in Pomerania (now Kamien Pomorski in Poland) made, it appears, the same discovery at the same time. In 1757, Michel Adanson (1727-1806) a French botanist, spent five years exploring Senegal and proposed that the discharge from the Senegalese (electric) catfish could be compared with the discharge from a Leyden Jar. Three years later, Van Musschenbroek expressed the same idea regarding the electric eel, found in Guyana. This theory was demonstrated in 1772 by John Walsh on another electric fish, the torpedo, or ray. In 1771, it was doctor and physicist Luigi Galvani (1737-1798) who, during his famous experiments on frogs concluded, perhaps a bit hastily, the existence of a form of animal electricity. In order to easily carry out electrical experiments, the physicists developed machines to generate electrical charges. The image opposite shows how Nairn's machine worked. Electrical charges were produced by rotating a glass cylinder against a piece of leather. The machine produced varied results and was extremely sensitive to changes in the level of humidity in the air. The German, HOLTZ, developed a more reliable machine using two glass discs, one of which rotated at high speed. With machines like these, it was possible to charge up Leyden Jars and carry out spectacular physics experiments. The Wimshurst machine, shown below, was a modification of HOLTZ' machine, developed by British physicist James Wimshurst (1832-1903) in 1882. Among the most influential generators, like the first and second Holtz machines seen earlier, the WIMSHURST machine had two advantages, it was a self-starting electrostatic generator (cranked by a simple handle) and was built to offer the maximum output, combined with minimum loss. Being easy to operate, Wimshurts's machine quickly became the standard found in physics laboratories throughout the world, used for electrostatic experiments..
Made of two glass or vulcanite discs, turning in opposite directions to each other, the discs had small sections of tin plate mounted on them and two metallic brushes were used to pick up the static charge. The first studies of sparks and oscillating electrical discharge were made using this type of machine. The machine invented by William George ARMSTRONG (1810-1900) worked on principles which differed from those seen so far. His machine was one of the first capable of generating power on an industrial scale. In this machine, electricity was generated by the friction of water droplets passing through steam. A boiler generated the steam which passed through escape valves and through metal tubes surrounded by moist tow (broken flax fibres). Electrical charges were collected by the metal branches installed in the exhaust jets. These machines were capable of producing an almost endless supply of twenty centimetre sparks. Without machines like these, radio would never have seen the light of day (or at least not in the way it did). Remember AMPERE, who, with ARAGO, invented the electromagnet in 1835? That discovery would serve as the basis for the electric telegraph, but also allowed the development of domestic electrical appliances from the middle of the 19th century, appliances found as much in the town as in the country. The electric door bell is, without doubt, the most common use of electromagnetism. The electromagnet attracts a hammer which hits the bell. This principle was used for the 'ringing' of the classic telephone, calling systems in hotels and hospitals. In PARIS, in 1889, the aristocracy were heady with the pleasures of La Belle Epoque and learnt of the technical progress being made, at the Exposition Universelle. The French celebrated the centenary of the French Revolution amid an explosion of technological advancement, climbing to the top of the Eiffel Tower, symbol of the exhibition. The top luxury hotels in the rich areas installed the latest inventions, much to the annoyance of the servants, for whom the unemployment bell was already tolling. The electric bell replaced the handbell and the liveried porter was to disappear, replaced by a simple, anonymous, button. 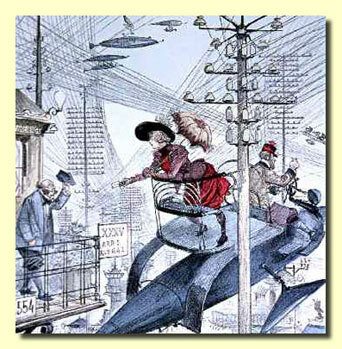 Visionary artist Albert ROBIDA (1848-1936) already imagined the potential developments of electricity and published in "la Vie Electrique" this futuristic cartoon. Press on this magnificent, hand-painted porcelaine button. Somewhere in the house, the tinkling of a bell will alert the mistress of the house to your presence. Electricity is used to transfer the information necessary for our day to day lives. Turn the button on this wooden switch and the living room lights up. It is true that at the end of the 19th century, gas lighting starts to disappear from houses, in preference for electric light. The Electric Fairy is welcomed into peoples' homes. By manoeuvring the switch, the internal telephone puts you in touch with your guests. But, where is the power coming from to drive the hammer on the door bell, or make the telephone work? In fact, somewhere, hidden in a cupboard, a stock of batteries, invented by dear Mr VOLTA, provides the current necessary for these devices to work. ... and don't forget to replace the fuses from time to time. Lead wire fuses were installed to protect against current surges and short circuits (we still say 'Blown a fuse'). 2 , 4, 6 or 8 x 40W lamps. It was a long way from our current domestic power needs, where a washing machine alone uses 3000W ! If so, why not try one of Volta's experiments? A piece of copper wire and a zinc plate are all you need to demonstrate the greatest electro-chemical principles. While the energy provided by a battery is enough to drive a door bell or internal telephone system, it is not going to provide the energy necessary to fill a house with light or turn industrial motors. The industrialised countries started building power generating stations in 1880. The first public electricity generating company was formed on the 12th November 1881 at GODALMING in England. Obviously, we are still a long way from the power stations of today, producing thousands of mega-watts of power, but even at the start of the 20th century, there were installations of an industrial scale. The current was distributed by aerial and underground cables (as in Paris, for example) in the towns to start with, before moving to the countryside. In France many villages were connected to the grid by 1930 but the more isolated ones had to wait until the 1950s. Landlords could finally advertise their properties to let as having "WATER, GAS AND ELECTRICITY, ON ALL FLOORS". Electricity was brought into people's homes as the distribution networks developed. Firstly, it was the rich areas of the large towns and cities, like PARIS, followed by the more populated areas. In 1920, it was already possible to install electirc heaters in the home. This bulb radiator for apartments, looks like a work of art. even windmills (in the middle of nowhere). The image opposite, shows a Universal DUCRETET dynamo, designed for training purposes. It was capable of producing a continuous 4Amps at 50 volts. The brushes and the collector are visible on the right, level with the shaft. The dynamo turned under power from a mechanical motor, connected via a drive belt. Water was, historically, the primary driving force for electricity generation (hydroelectric power). The image opposite, shows a PELTON turbine, used in long drop water falls. The relaxing power of steam is quickly used in machines of greater and greater size to power the generators of electricity destined for private (factory) and public (distributed domestic and public lighting) use. The earliest electrical generators provided continuous current, but researchers like Nicolas TESLA, showed that the use of alternating current was more economic and easier to manage. The Electric Companies therefore started to install alternators, producing alternating current, capable of being carried over much longer distances than continuous current. We see here, an alternator equipped with an exciter at the end of the shaft. The current is not the same everywhere and in the case of alternating current, the frequency differs from one place to another (in general, 25Hz or 50Hz in France, 60Hz in Anglo-saxon countries). Nothing was yet fixed at the start of the 20th century, but the electricians were quick to realise the need to standardise their field and introduce guidelines which could be applied on an international scale. They also realised that the enormous production of electricity posed technical problems, not least because electricity cannot be stored and has to be generated at the moment of the customer's needs. This rapidly led to the establishment of agreements between competitors establishing mutual support in the case of a lack of production and interconnected distribution networks, allowing the transfer of energy in times of need. Which just goes to show, one invention is never enough! In fact, we don't need to know what electricity is, just that it works!! ... and, we can use it for the Radio. For more information on the construction and use of electrostatic machines, please visit : wimshurst.